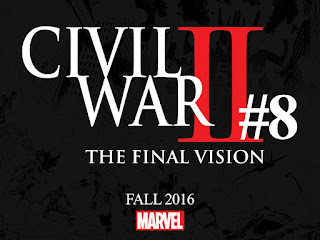 The Geektified Blog: Exciting Civil War News from Marvel Comics! The Battle Between Marvel’s Greatest Heroes Just Got Bigger! New York, NY—August 16th, 2016 — It’s the story that has the world on the edge of its seat as heroes stand on opposite sides and fight to preserve the security of the future. And if you thought it couldn’t get bigger – you thought wrong! 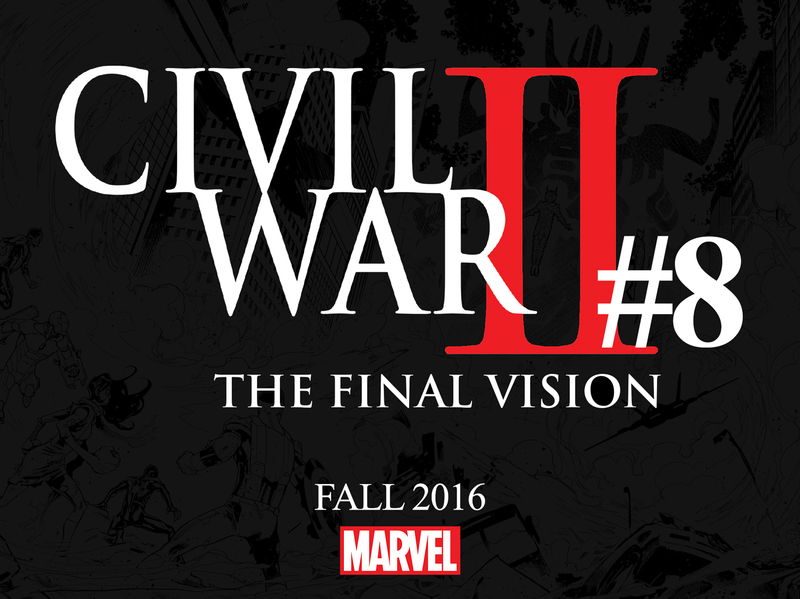 Today, Marvel is pleased to announce the expansion of the blockbuster Civil War II event with CIVIL WAR II #8 – coming to comic shops later this year! Legendary creators Brian Michael Bendis and David Marquez will extend their stay in the trenches of battle for one more unforgettable issue. Cracks are starting to immerge in the predictive visions of the new Inhuman, Ulysses, and the foundation where our heroes once stood is starting to fracture. Will the heroes of the Marvel Universe wield the power of “predictive justice” to change the future or battle to protect tomorrow? The additional issue of Civil War II will bring the explosive event to its powerful conclusion, but with an Inhuman at the center of the conflict with the ability to see what’s to come, has the future already been foretold or can it be changed? Ideologies have been challenged, alliances have been tested, and battle lines have been drawn. What will be the end result as the final vision from Ulysses is revealed to the heroes of the Marvel Universe and which side will stand triumphant over the other? Join Marvel this fall as Iron Man and Captain Marvel gather their sides and come head-to-head for the epic confrontation in CIVIL WAR II #8! Nothing contained in this e-mail shall (a) be considered a legally binding agreement, amendment or modification of any agreement with Marvel, each of which requires a fully executed agreement to be received by Marvel or (b) be deemed approval of any product, packaging, advertising or promotion material, which may only come from Marvel's Legal Department.